An early post when I was a blogger "newbie" -- September 2008 -- almost two years ago! This was the first tea that I shared and it is still a favorite post. 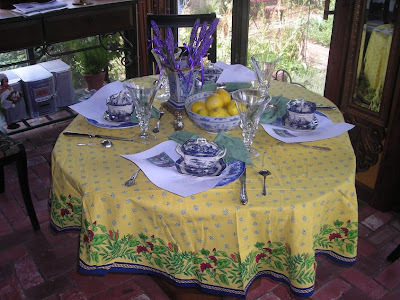 My beloved blue and white sets the table (as it usually does) and there is good food to go with the freshly brewed tea. It's Sunday which means that it's time to visit Chari at Happy to Design and see what other favorites there are this Sunday. I love afternoon teas -- a habit that we adopted on our first trip to England where I fell in love with an English cream tea. 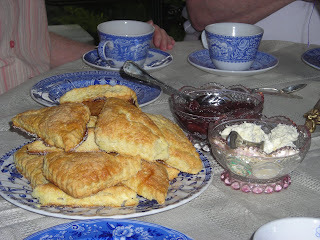 It's still my favorite sort of tea -- scones, really good freshly baked ones, real Devonshire cream and strawbery jam. With a cup of real English tea -- either Typhoo or PG Tips and I am transported back to an olde English tearoom. On a trip north I was able to snag some real Devonshire cream at a reasonable price and since I could not have a cream tea alone, I invited some friends to share tea with me. My favorite scone receipt is not English but rather inspired from a favorite, Ina Garten, The Barefoot Contessa. Made plain for this tea without any dried fruit or currants. It's easy to do in the mixer and makes the flakest scones ever. They're the best breakfast scone when you add dried fruit, nuts and orange peel. Besides the best scones and real Devonshire cream, I also had homemade strawberry jam with big plumb pieces of strawberry in the jam. 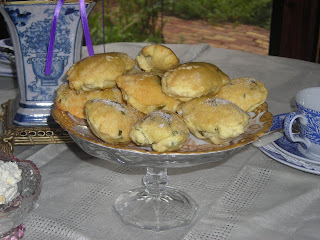 We also enjoyed madelines, a favorite cookie especially at tea time. 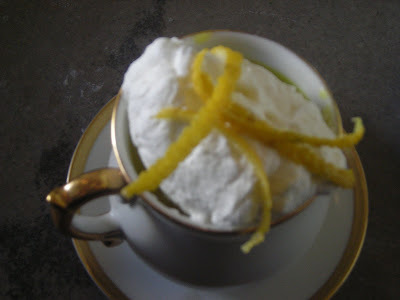 This one inspired by a magazine receipt for a lemon basil cupcake. 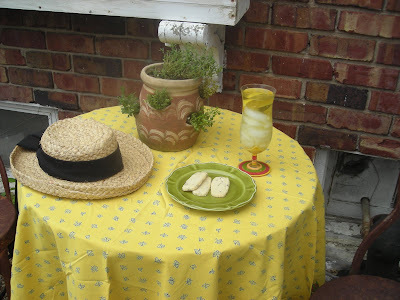 I made my favorite madelines and added lemon peel and chopped basil to the batter rather than the rosemary and orange I do so often. 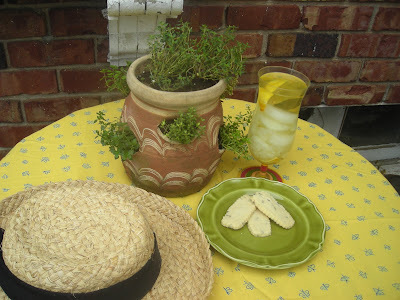 We enjoyed the afternoon with pots and pots of tea, eating scones, jam and cream and leaving only crumbs of the lemon basil madelines. Combine 4 cups flour, 2 tablespoons sugar, the baking powder, and salt in an electric mixer fitted with a paddle attachment. 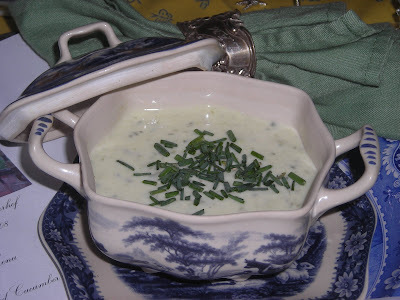 Blend in the cold butter at the lowest speed and mix until the butter is in pea-sized pieces. Combine the eggs and heavy cream and quickly add to the flour/butter mixture. Combine until just blended. The dough may be a bit sticky. 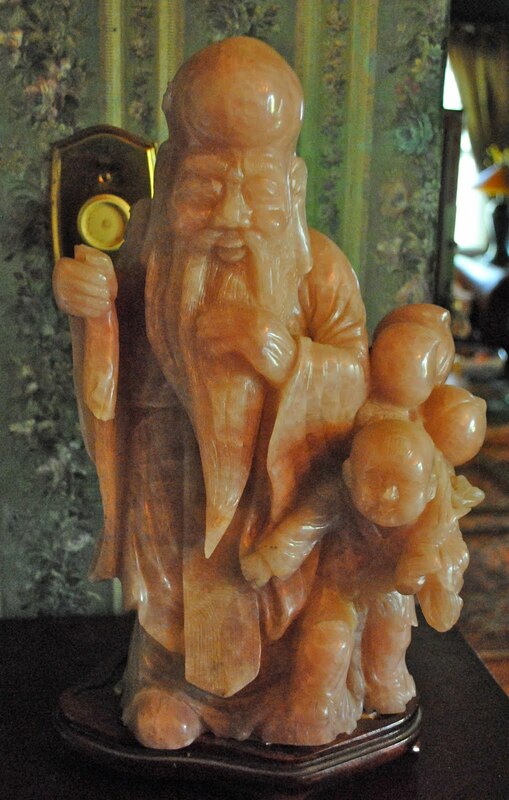 In a corner of the dining room on a pedestal is a favorite of ours -- The Pink Man -- An Asian carving that husband Jim gifted me with eons ago. I'm not sure what he's made of but he is a special piece and he does brighten up that corner of the dining room. He's an imposting figure and does deserve to be on a pedestal. The perfect place for him! I love the creaminess of the material that he's made of -- he's detailed but not too much. He stands on a small rosewood stand atop the pedestal. We love Asian art but finding good pieces now are far and fewer between than it used to be. We treasure each of our Asian pieces. Asian art is a big part of Linderhof. And a big part of our Asian art is in the dining room. Jim's Green Man started it all! It's Saturday -- time for Pink Saturday -- please join Beverly at How Sweet the Sound for other pink Saturday participants. We feed the birds year round. Black sunflower seeds. It's a good basic food that attracts lots of varieties of birds (and sometimes squirrels). But not all birds are neat eaters like the blue jay or the chickadee. They scratch, they get into the feeders and seed gets on the ground and into the garden beds. It's a struggle, early on, for there are all sorts of sunflower seedlings sprouting where we don't want sunflower seedlings. And try as I might, I never manage to get all of them. 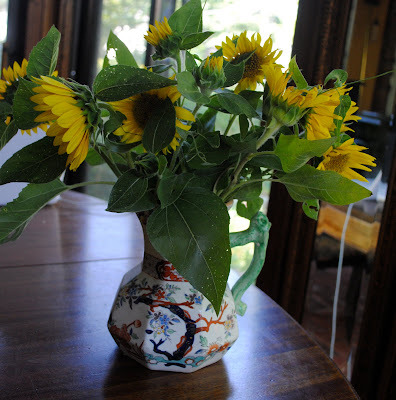 Thus, in mid to late July and August, we receive a gift from the birds -- for the sunflowers bloom. And they certainly brighten the breakfast room when placed in an old Mason's pitcher. 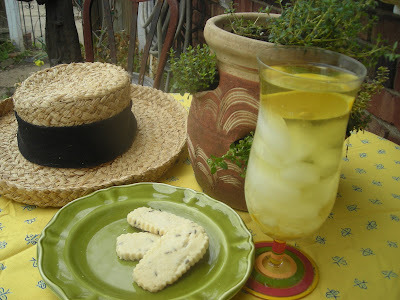 Friend Cynthia emailed this morning that she'd like to stop by at 2 and she was bringing cookies. My response -- "I'll put the kettle on". A casual tea and since neither of us take anything in our tea, just cups and saucers -- but a wee tea cloth tea napkin. There's no other way at Linderhof. Besides a nice visit, we discussed fall classes that I would be teaching at her shop. Ideas flowed and I am eager for this fall's classes. Should be some fun Thursday nights at Life + Style! 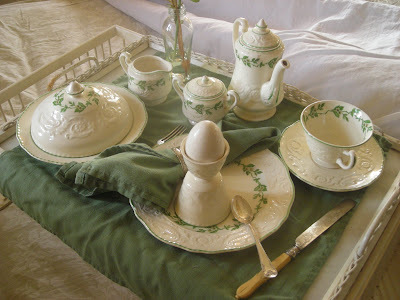 My Spode was just right for the tea for two -- the Spode teapot and two teacups. There is nothing like blue and white Spode for afternoon tea. The cookies were her perfected chocolate chip and some pecan cookies that her father favored. 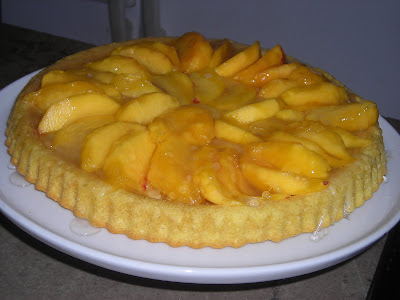 Both were yummy and went very well with the real English tea I brewed. Besides the cookies, Cynthia brought me a get-well gift. Cynthia knows me and my love of herbs -- her gift was this wonderful book which I shall treasure. And after saying goodbye, after our visit, I poured myself the last cup of tea and went through the book cover to cover. It's a wonderful book. One I shall treasure. And parts of it may become part of my herb presentations. 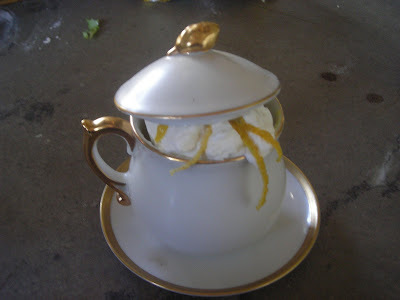 This was not a summer post but lemon pot de creme would be a good cool dessert for a summer dinner. Alas, our desserts the last couple of weeks have consisted of ice cream, I prefer Hagan Das vanilla bean or rum raisin while Husband Jim prefers anything Ben and Jerry and chocolate! 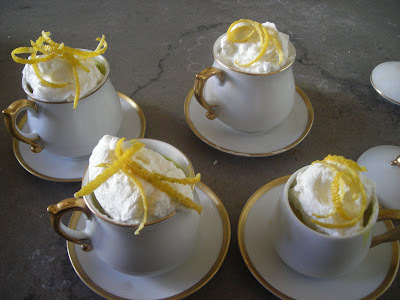 These are easy desserts but fancy desserts and I love the little cups that they're served in. It's Sunday and time for Sunday Favorites so please join Chari At Happy to Design to see what other favorites there are this Sunday. 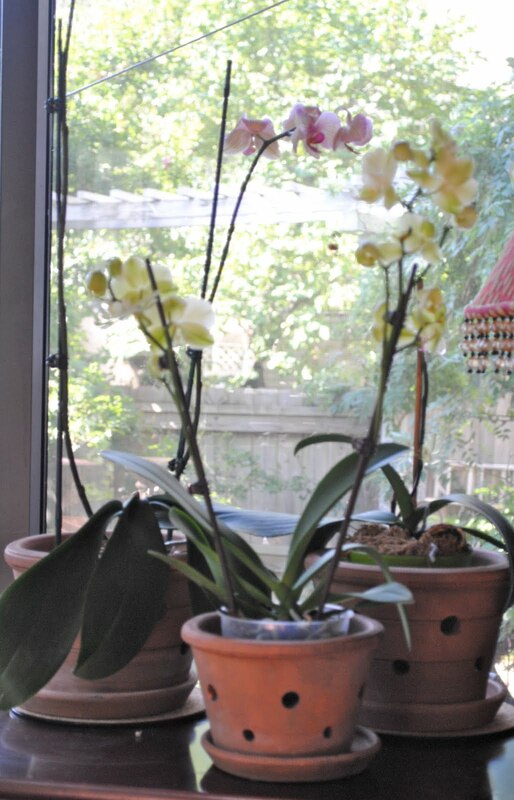 The orchids live happily in the north window of the breakfast room on an old game table. their bloom lasts a long time and whether it's summer or winter it is nice to have bloom indoors. 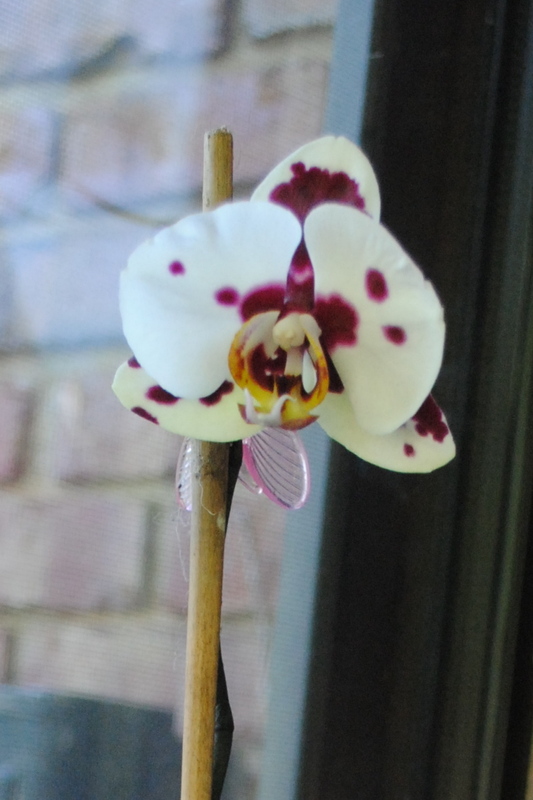 Our orchids are keepers -- we don't buy them just for the bloom and once gone, they're gone. They become part of the family. And often, they will rebloom. Like this pretty splotched burgundy/purple and white one. Bought for it's coloring which was so unusual a couple of years ago. It's rebloom is as pretty as it was when we first bought it. A pink "butterfly" orchid clip holds the stalk to the post so that the orchid doesn't sprawl all over. Posts and clips are kept near the orchids in a vase on the floor -- ready to be used whenever the orchids bloom. They were tasty and they were a good addition to the yogurt on my breakfast tray. They satisfied Husband's Jim need for a munchy mid-afternoon after surgery. I don't bake often with strawberries -- my pies or tarts all use fresh berries. We prefer strawberries raw. But sometimes, I have a few left that are "past their prime" and so it's time for either muffins or bread. Either make a good nosh for afternoon tea or . . . . a good addition to the breakfast yogurt or . . . . .a good nosh when you're wife is in the hospital and you're bored! Stir together flour, sugar, baking powder and salt. Beat eggs. Blend in oil, vanilla and milk. Add liquid to dry ingredients. Stir quickly just until moistened. Fold in strawberries. Spoon into well greased 2 1/2 inch muffin tins or paper lined muffin cups. I sprinkled each muffin with vanilla sugar before baking. It's Friday which means that it's time to share Foodie Friday with all of our Friends over at Designs by Gollum. Please join Michael to see what else has been cooking this week. 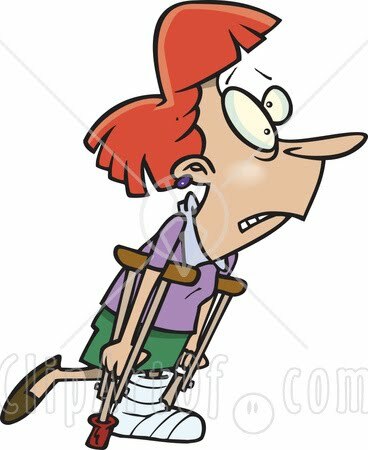 My healing continues -- I have graduated from walker to cane to "nothing" and that is a great feeling! But, alas having company for lunch or dinner will be a while yet. 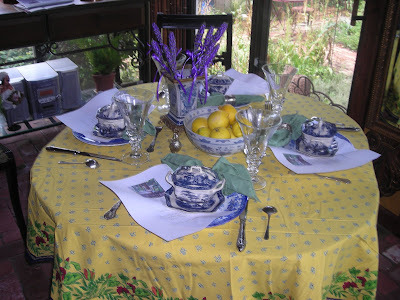 This was a favorite luncheon that I did last summer -- it is full of summer colors and the luncheon was full of summer flavors. It is one of my favorite tables of all times! I like hurricanes. They are a great way to get a worry free fragrance free candlelight at Linderhof. I had been looking for some hurricanes for the table at the bottom of the hall -- on line -- but the cheapest was $150 per pair and they were plain Jane. I thought that I might order them in July as I really needed a pair for the table at the bottom of the hall. And then we went to an Estate Sale . . . . I found this pair for $40 each -- and they are perfect -- much more perfect that the ones I was looking at on-line and (with shipping and such) for half the price. They are a thick engraved glass and hold a nice size pillar. (Fragrance free, of course) and the other night when the electric went out, they performed their job superbly. And, too, when we have a dinner party they can be whisked to the dining room table as a change of pace to the candlesticks that we usually use when we have company for dinner. It's Tuesday, time for Tabletop Tuesday with Marty at A Stroll Thru Life. We enjoy the garden birds -- even the ones considered "pests" . . . and to me the prettiest of the pesty birds is the Jay! Another reason to like the Jay is that Mrs. Jay and Mr. Jay are so difficult to tell apart and even Teen Jays are like their parents that you have to look closely to tell you that they are part of this year's brood. Every year we start with two and then along come mid to late July the garden is overrun with these blue birds. They are large and they are loud but we enjoy them and don't mind them in the garden. They are not greedy feeders either -- for they take one sunflower seed at a time and fly off with it to first break it and then eat it. The Jays were out in force the other day -- almost as if they were posing around the blue pot on the table under the pergola. It's color echoes their color. The second picture is a parent and a baby -- I can only tell because first the baby was on another feeder and you could tell by it's wings that it was a teen and not an adult. It's Monday and time for Blue Monday with Smiling Sally. There is a lot of art that hangs at Linderhof but some of that art is Linderhof. 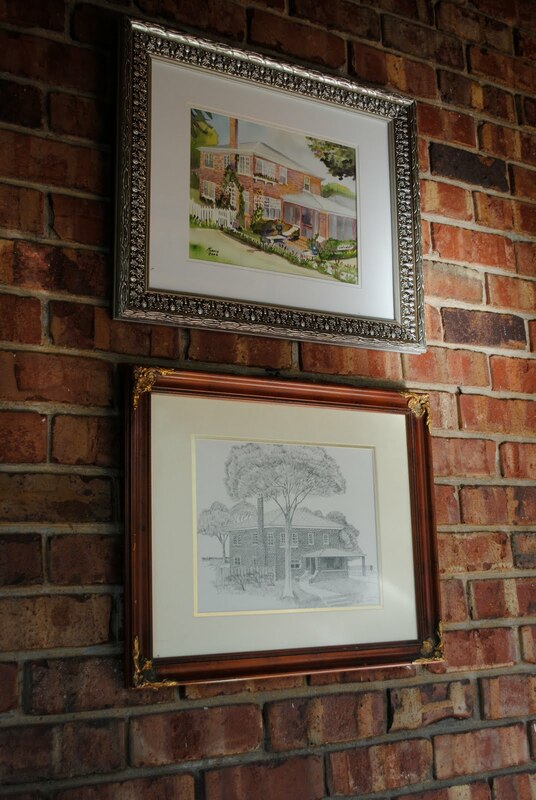 Hung at various places in the house until we built the breakfast room, we deemed the brick wall (the original west outside wall) was the perfect place for our two pieces of Linderhof art. Bought many years apart, one is a pen and ink while the other is a watercolor. 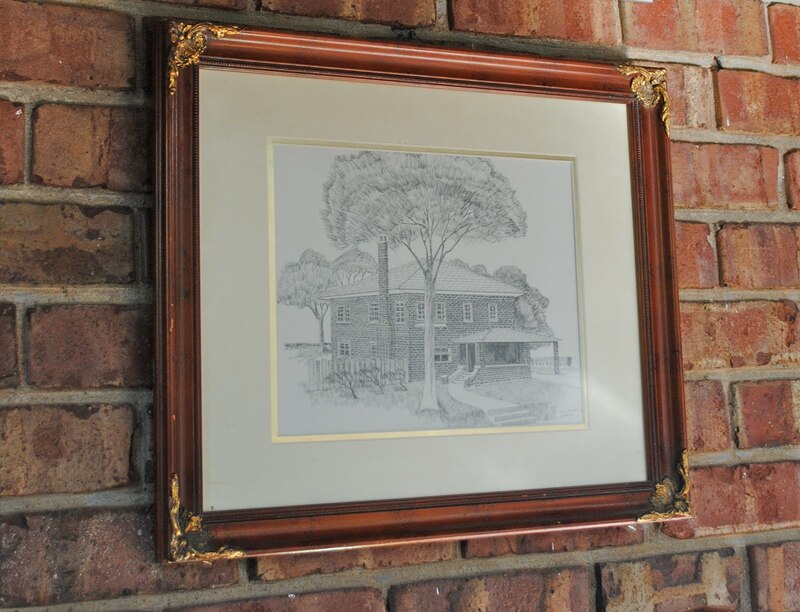 The first is a pen and ink drawing of Linderhof made by a retired graphic artists who was a great detailist (look at all the bricks) but did take liberties with windows and such. He was a dear dear man and his price for the piece was very reasonable. Over the years, we've used the picture for note cards. Which are perfect for both thank you notes and for invitations. The other is a water color. 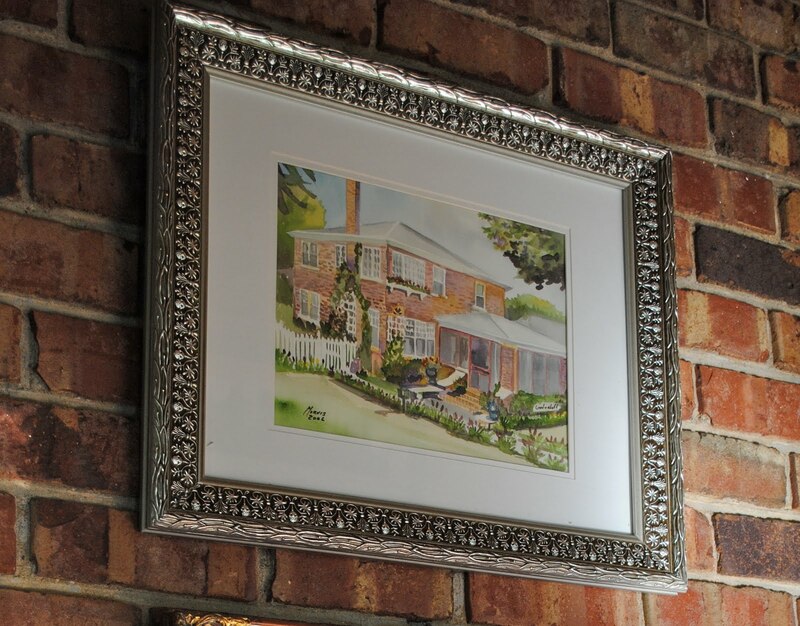 Done by a gentlemen who moved to Fort Scott and opened an art gallery. 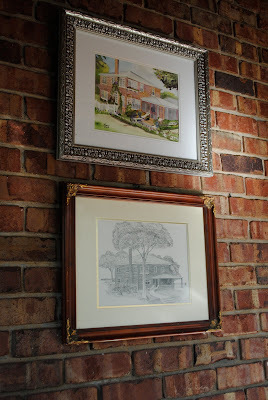 He was a versatile artist and dabbled in oil, pen and ink and watercolor. I had wanted a watercolor of Linderhof "forever" and was so pleased with his rendition. I've not had this made into note cards, but I think that may happen sometime in the future -- in fact, I need note cards of both pictures. But, I also am enamored by PVE Designs watercolors and that is next on my agenda -- a PVE watercolor of Linderhof. It will be perfect on the wall along with the other two! 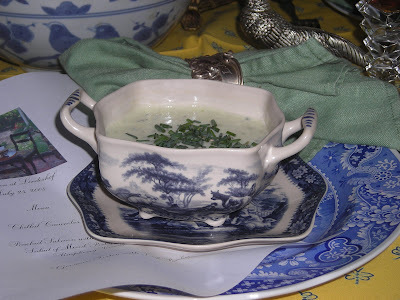 It's Show and Tell Friday with Cindy at My Romantic Home -- and I'm sharing my two pieces of Linderhof as Art for Show and Tell Friday. We feed birds year round at Linderhof -- in real bird feeders, seed scattered on the ground, seed placed atop statues and such. And this St. Francis figure that at times is a bird feeder. Other times it is a squirrel feeder. For today one of the squirrels (we know there are more but we rarely see more than one) decided to lunch at the just filled feeder. Our squirrels are brown squirrels and Daughter Sarah comments that even though squirrels are cute, they are still rodents but with fluffy tails! Outdoors at Linderhof is now seen only from Indoors (and will be for a while until my knee is healed) -- but the breakfast room gives us great vistas to the back garden and even though we are indoors, it does seem you are surrounded by outdoors. 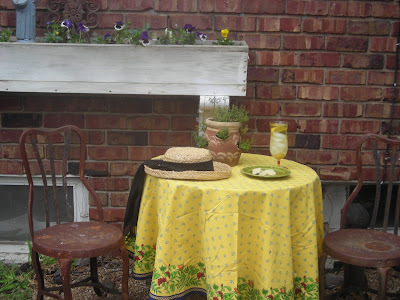 It's Wednesday and what better time than to visit Susan at A Southern Daydreamer for Outdoor Wednesday! We love candlelight at Linderhof. We have lots of candlesticks -- silver and brass, two pair of silver candleabras -- one large and elegant -- too elegant actually for Linderhof -- and the other pair a smaller pair that came home with us from a trip to England. But I also love hurricane style shades that candles fit into -- you don't have to worry about stray breezes and for safety, the candles are contained, thus the risk of fire is much less. In our breakfast room, on the sideboard, this summer we placed one of our favorite hurricanes -- an item off the sale table at one of our favorite garden places. With a big fat pillar in it, it gives great light in the breakfast room. The sideboard is in it's summer finery -- with two old silk flowers in pots from France and reproduction Staffordshire "poodles" (or lambs or lions). Every evening, we light the pillar for there is something special about a candlelit room. In the winter, two ivy topiaries live there but change is nice and we do like this summer version. The topiaries summer in the garden! It's Tuesday -- which means that it's time for Tabletop Tuesday. 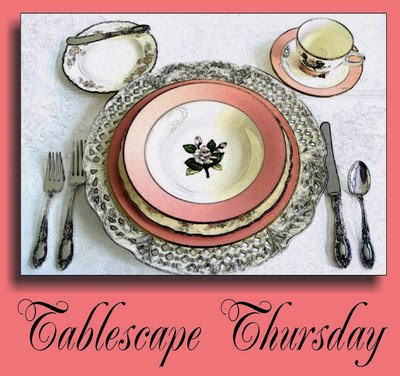 Please join Marty at A Stroll Thru Life to see the other fabulous tabletops this Tuesday! 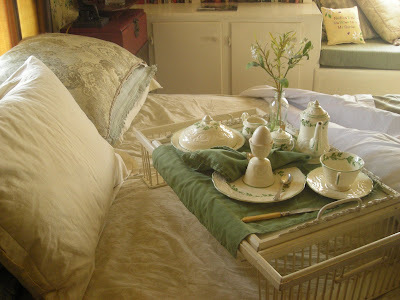 I love silver -- whether it is my napkin keepers, cutlery, tea acroutements, or the silver things on my dressing table. And I do love cutlery --when we go to Estate Sales, I'm always the one pouring through the silver to see if there isn't something that's old, odd or engraved. Many times I'm successful. But some things that I love are not things that I've bought but rather things with memories attached to them. These forks, which I love to use for tea and dessert fall into the latter category. They're precious to me and I do think of the remarkable woman whose initials are on them every time I use them. It's Silver Sunday -- so please join Beth at The Gypsy Fish but it's also Sunday Favorites so please also join Chari at Happy to Design. I love these forks and love sharing them with you again. 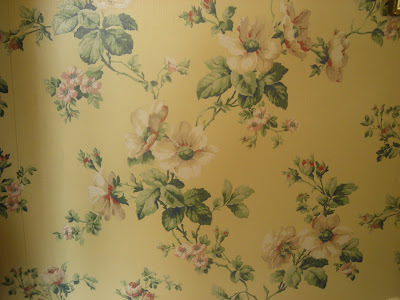 Mrs. Boland was our "landlady" for five years and our friend for the rest of her life. An English lady, she taught us how to brew the proper pot of tea, the pleasure of a pot of tea in the afternoon,and how to baste an egg for breakfast. Sometimes, for tea, we would have cake. Always served on a china plate, with a wee linen tea napkin. The cake would be eaten with a silver fork. These forks, small forks. In a set of six that the English so prefer. Perfect for tea cake. Fancy but not too fancy. With a good weight in the hand which is important in silver cutlery. When Mrs. Boland passed away, "Charlie" gave my mother these forks as a memory of his wife and mother's dear friend. She never used them, but wrapped them in tissue and stuck them in a drawer. When mother passed away, I found the package of forks and found this remembrance of my childhood. I remembered all the cups of cambric tea that I shared with mother and Mrs. Boland. I remember the cakes that we ate with these very forks. Engraved with a "B" for Boland. It's Sunday which means that it's time for Silver Sunday with Beth at The Gypsy Fish. 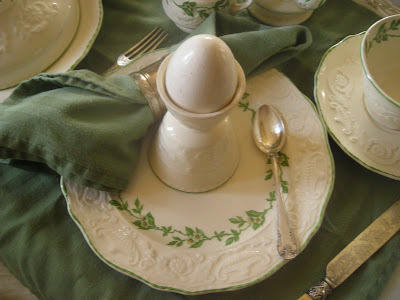 Please join Beth to see what everyone's silver treasures will be this week.